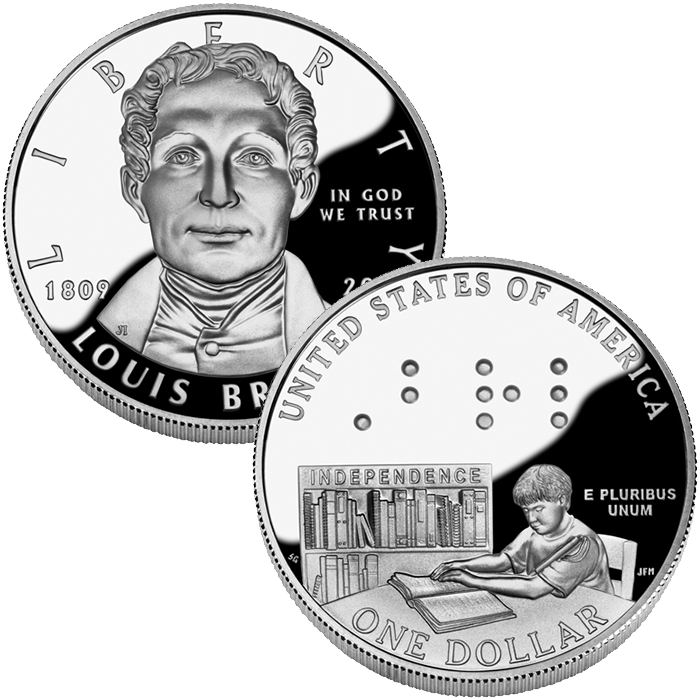 Celebrating the bicentennial of the birth of a revolutionary inventor, the 2009-P Louis Braille Bicentennial Proof Silver Dollar was released by the US Mint on March 26, 2009. Louis Braille, who was born with sight but became blind at the young age of four, was responsible for the invention of the Braille Reading System used by those who are visually impaired to be able to read text. It uses a system featuring a maximum of six raised dots in two columns to represent each letter. A surcharge was placed on the sale of each coin by the US Mint with the funds raised being forwarded to the National Federation of the Blind to promote Braille literacy. No more than 400,000 of the Braille coins were allowed to be struck across all product options. The Braille Silver Dollars are struck from 90% silver and 10% copper. The US Mint released the Braille Silver Dollars on March 26, 2009. An introductory price of $37.95 was offered by the US Mint for the Braille Coin. Prices were raised to $41.95 on April 27, 2009. 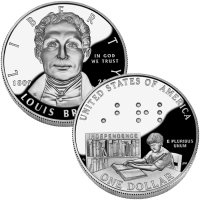 The portrait of Louis Braille found on the obverse (heads side) of the coin was designed by Joel Iskowitz and sculpted by Phebe Hemphill. The reverse (tails side) shows a young child reading a Braille book with the letters BRL shown in actual Braille above him. It was designed by Susan Gamble and sculpted by Joseph Menna.